We picked up our first CSA share of the season on Wednesday and are now the happy owners of fantastic farm-fresh produce straight from the farmer. Here in New York we have great greens and herbs, with a trickle of strawberries and cherries. So, why then, am I craving mangoes? Well, they are in season, just not in NYC. I made mango salsa for a dinner with friends a while ago, but things were too hectic, and late, for pictures. Ever since then I have been wanting to make a batch to share with you. A few evenings ago I had the chance. These mangoes were super sweet, and I cut the sugar with lime zest, lime juice, red onion and cayenne. Please adjust the spices according to your tastes. This recipe could be great with more salt, herbs, chilies, or peppers. 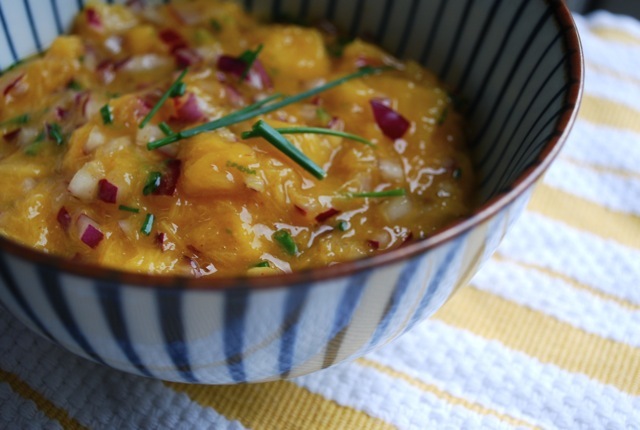 As long as there are mangoes, you will have an awesome summer condiment. Remove the mango flesh in some way. I halve, cut it into segments and then slice off the peel. Dice the mango and scrape the flesh, along with juices, into a large bowl. Then add everything else. Gently stir, and allow to sit out for a couple hours, or refrigerate. Serve with everything, especially chips.